The nominations are out for this year's VMAs. Too bad it'll be in Miami again. It's not as glamorous as New York but it'll have to do the trick. Green Day scored the most nominations, earning eight in all including Video of the Year. Missy Elliott and (my fave) Gwen Stefani received each 6 nominations. And since it is music talk, congrats to Mr. Arjan for his mention on Forbes.com (parabens!). Now this is serious, and is all over the news in Brazil. Last Friday, 27-year-old Brazilian Jean Charles de Menezes was shot dead by mistake by Scotland Yard in a subway station in London. Jean Charles had left his home to go to work and his dark skin tone aroused the suspicions of the police surveillance team. He was shot eight times in the head and torso at point-blank range while lying unarmed and defenseless on the floor of a tube train. Officers say they mistook the man for a potential suicide bomber. 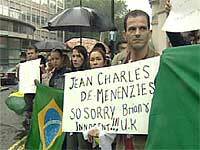 The Brazilian and British authorities and press both agree that Jean Charles was innocent, and Scotland Yard has apologized for the accident. What kind of world are we living in? I like Summer because it usually allows me to catch up on my reading since I have a little more free time (and I multi task by reading while also tanning or relaxing). Michael Cunningham's Specimen Days was the last book I finished, so I decided it would be the first to be scrutinized here. While I am (obviously) not a literary genius, I must say I was expecting a little something more from Mr. Cunningham based on his previous books. What do you guys think? It is pretty hard to beat Ale Marchi or Rafael Verga, huh? The private pics are coming early next week... And they are way better.